At Fratelli Minotti every design request and requirement is made possible thanks to the individual skills and SCM technology. The company, located in the heart of the Brianza, works as a subcontractor for the most important furniture factories. Entering the premises one has the impression of being in a showroom, where three generations of SCM edgebanding machines operate at the same time. The new Morbidelli Author M600 work centre allows other types of machining operations and new orders. The Minotti brothers and their company represent the essence of the active Brianza and its values, that have made this land one of Europe’s leading districts of production excellence. The family, the correctness, the commitment, the work (a lot of it), the trust in individual capacities, the sobriety of the approach and the technology are the distinctive traits of this, as well as other companies, in this area. As far as the Minottis are concerned, it all began in 1973 when Luigi and Virginio decided to accept the inheritance of their father Giuseppe, a very talented cutter, and started their business dedicating themselves to edgebanding in particular. The years after the post war economic boom maintained the euphoria of a country that had picked itself up from its feet, despite showing the first signs of difficulty and social tension. The Brianza furniture factories produced high quality furniture that was very successful in Italy and Europe. 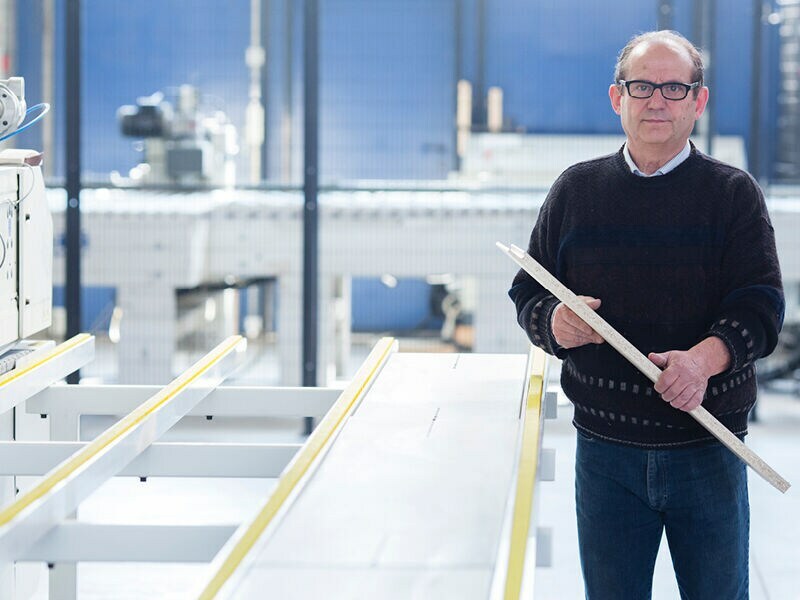 The companies worked at full capacity and there was a need for subcontractors specialised in specific machining operations and the Minotti brothers soon made a name for themselves for edgebanding. In 1976 the Minottis carried out the first shaping work, which was then followed by softforming, of which they have become undisputed masters. From that moment onwards the company established itself as one of the leading edgebanding sub-contractors for the largest companies in the sector. Fratelli Minotti currently employs ten people. The presence of the family is fundamental: the owners Luigi and Virginio and their sons Stefano and Davide. For the new generation of the family the responsibilities are constantly increasing and they are responsible for the management of the new sophisticated machines that make extensive use of electronics. Fratelli Minotti is fully part of the Brianza production process. The main customers, located in an ideal radius of 10 kilometres, are proud representatives of made in Italy furniture that continues to represent the pinnacle of the global furniture sector. For the Minotti brothers trust and reliability are not taken for granted, but are tangible values that must be measured and tested every day. Naturally this led to a stable and long-term relationship with SCM. The Cabiate plant is a sort of showroom for the latest SCM solutions and at the same time a functional museum of the group’s technologies. 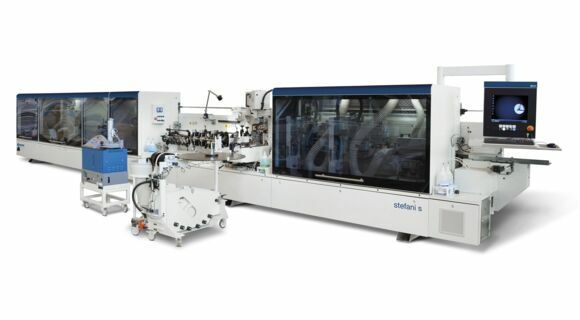 Updating the machines is fundamental for the Minottis, but if a machine is still operating well, it continues to be fully integrated in the production process. Visiting the company is therefore fascinating because one can see thirty year old machines next to the latest work centres and edgebanders. 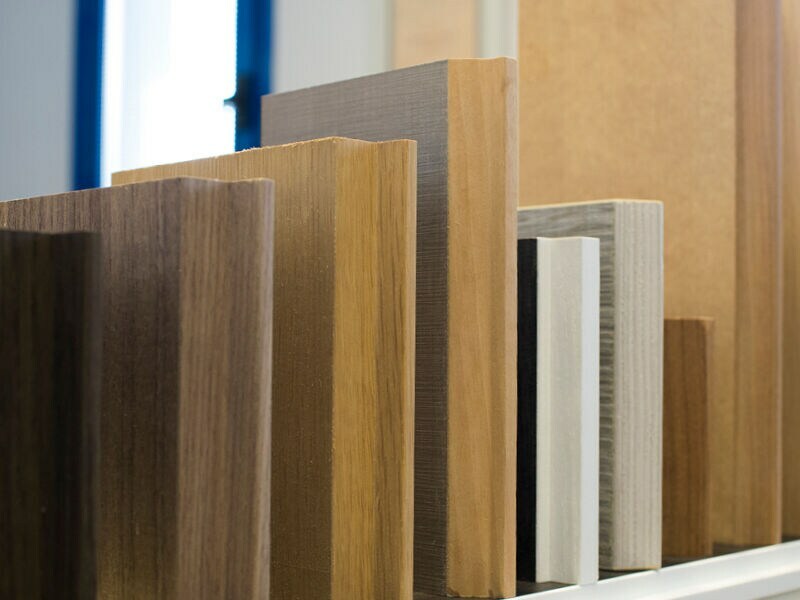 The Minotti brothers have made a name for themselves with wooden edgebanding, but the production includes ABS, PVC and melamine materials. The company produces furniture parts requested by its clients, who then assemble them or they proceed with other machining operations in order to deliver the finished product. The production cycle of the market has changed in recent years. From the large productions of a single part the market has shifted to small batches for increasingly customised solutions. In order to meet these demands SCM technology played a leading role in the Minotti’s activities, which count flexibility as one of their strengths. Due to the specific aspect of these machining operations and the customers’ requirements, the edgebanding is performed on a single side of the panel and certain delicate operations are finished by hand because the final product must be perfect, without any defect. Visiting the company where everything is spick and span is like taking a trip back through the history of wood working machines. Various generations of machines can be found side by side, still operational, thanks to the meticulous attention given to their maintenance. As far as the edgebanding is concerned, the latest addition is a Stefani Solution (since May 2017 “Stefani S”), which became operational just before Christmas 2016. 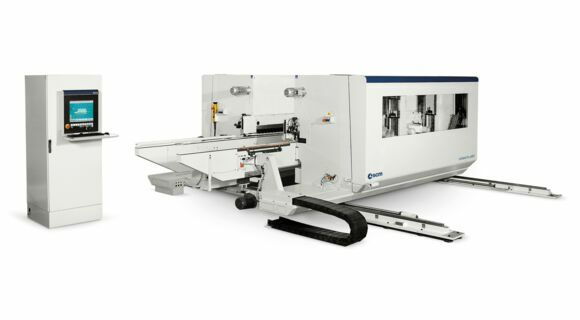 This extraordinary machine allows operations such as the J shape and it can perform any type of edgebanding to meet the creativity and requirements of the most demanding customers. The Stefani is reserved for the most specific machining operations and its software is fundamental for the precision of the work,which is supervised by Stefano Minotti, who is the family expert for these types of operations. The company also uses two cells that have the same composition, even though they belong to two different generations. 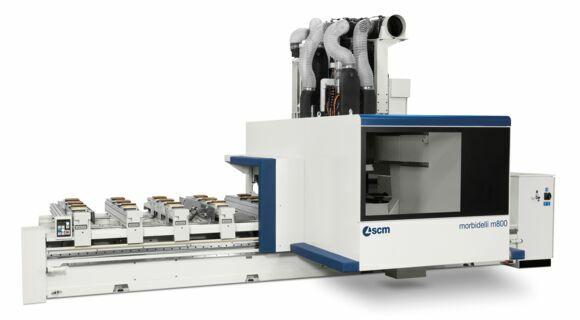 The first and most recent is a Celaschi squaring unit that machines the panel to the desired measurement. This is followed by the Stefani Monomatic edgebander, which takes care of the heavy-duty work. These machines are a testament to the reliability of SCM equipment; the years pass and they remain perfectly operational. The unloading is taken care by an automated storage system that prepares the panel, edgebanded one side at the time, for the subsequent passages. The other cell is rather unique as it includes a “tipo 280” Celaschi and an Olympic System, both thirty year old “grande dames”, but still operational. As Virgilio Minotti explains: “For certain very particular machining operations we prefer using the Olimpic, which becomes a sort of assistant for the manual work”. As far as the work centres are concerned the jewel in the crown at Fratelli Minotti is the latest Morbidelli Author M 600 (since May 2017 “Morbidelli m600”), complete with all the optionals, that allows the company to meet the customers’ requirements also for other operations. Any type of drilling and routing is possible, to complete high quality elements. In this case it’s the other young Minotti, Davide, who looks after the new Morbidelli, where the lion’s share of the work is carried out on the graphic interface and the Maestro software, which can easily be programmed for any type of machining operation. Thanks to this work centre the Minottis are able to fulfil orders for extremely specific productions, where all the machining operations and the furniture parts are produced entirely in-house at the Cabiate plant and often even partially assembled. Virginio’s words sum up Minotti’s experience: “Our work is based on technology and the personal skills of each one of us. Our machining operations are so cutting edge that we must continuously invest in equipment that allows us to respond to the precise requests of every customer. This is why we have chosen SCM solutions over the years. Their machines can adapt to our highly flexible production and are guaranteed by an extremely professional technical support”.